79 supporters of ousted Egyptian president given jail terms of between five and 10 years over their involvement in deadly clashes. An Egyptian court on Wednesday sentenced 79 supporters of ousted president Mohammed Morsi to jail terms of between five and 10 years over their involvement in deadly clashes, judicial sources said, according to AFP. The defendants were convicted for participating in clashes between Morsi supporters and opponents that killed 12 people in the Mediterranean city of Alexandria last July, after the military overthrew the Islamist president. 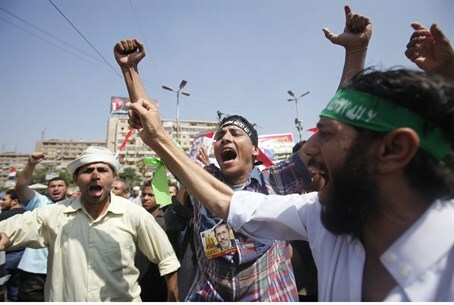 Since Morsi's ouster, supporters of him and his Muslim Brotherhood movement have been staging weekly protests calling for his reinstatement. The rallies have often degenerated into violent street clashes with security forces and civilian opponents. Eleven defendants were given 10 years in jail, 13 were jailed for seven years, 55 were jailed for five years and seven acquitted, the sources added. They were accused of murder, attempted murder, carrying weapons, and torturing 16 people in an Alexandria mosque, the sources told AFP. At least 1,400 people, mostly Islamists, have been killed in street clashes since Morsi's overthrow, and thousands have been jailed. Hundreds have been sentenced in mass trials, including 683 supporters of the ousted president who were given death sentences in late April, and another group of more than 520 people who were given death sentences on charges of killing a policeman during an attack on a police station last summer. Morsi himself faces three trials on various charges, including collusion with militant groups. Almost 500 security men have also been killed in a wave of terrorist attacks carried out in retaliation for the crackdown on Morsi supporters. On Saturday, Egypt charged 200 suspected members of the Al-Qaeda-inspired Ansar Bayt Al-Maqdis, which has claimed responsibility for the bloodiest attacks since Morsi’s ouster. Egypt’s interim government says there is a direct link between the Muslim Brotherhood and Ansar Bayt al-Maqdis, and on this basis blacklisted the Brotherhood as a terror organization.